Starting back in 2002 with around 20 stalls, the markets now average 170 stalls and crowds in excess of 3,000 people filling Bulcock Street each and every Sunday of the year. 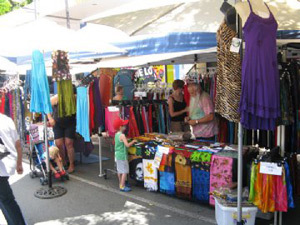 Markets on Bulcock have grown to be one of the largest and most popular markets on the Sunshine Coast. Rain, hail or shine, Markets on Bulcock showcase the very best, unique arts and crafts the Sunshine Coast has to offer. Never a dull moment with family entertainment, fresh produce and flowers plus visitors can enjoy the many local cafes, boutiques and over fifty speciality shops open on Sunday in Caloundra’s CBD. On Sunday 22nd April, Markets on Bulcock will be buzzing with entertainment and a birthday party theme. At 10am in Felicity Park, the Chamber of Commerce will formally celebrate the occasion with special guests and birthday cake to give away. So don your party hat and head down to the Markets on Bulcock on Sunday 22nd April to be part of the birthday extravaganza.